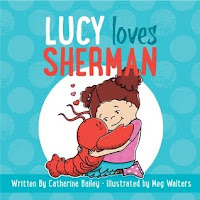 This entry was posted on Friday, May 26, 2017 and is filed under Book Review,Catherine Bailey,Children's Book,Lucy Loves Sherman,Meg Walters,Sky Pony Press. You can follow any responses to this entry through the RSS 2.0. You can leave a response. Wasn't this adorable, and I loved the message. Great review Ethan. This sounds like such an adorable and cute read! Friendship is such an important message to send out to kids, and it sounds like it does a good job of doing so.